Can I tell you that I have started and stopped posts about this little statue three or four times? I have had him since October. October!!! A lifetime in blog years! I don’t know what’s wrong with me. I guess I don’t want to offend anyone by saying something weird or irreverent about a religious statue, so I’m frozen in space. Do I call it a statue? Do I call it an icon? Do I capitalize the H in the word “him”? I just don’t know!!!! I do know that I like the statue and it has sat on my desk every day since I bought it in October. When I saw it sitting on the top shelf at the thrift, totally out of place among the brass candlesticks and smelly cookie tins, I was oddly drawn to the statue. The light jadeite green of the interior of his robe (see, I almost called it a coat) was beautiful. The whole coloring of the statue shouted 1940’s to me. And I just felt that I needed to save him from his lowly resting place. How something like this comes to a thrift store bothers me. Was the owner now deceased and her relatives callously threw it in a donation box? It wasn’t until I checked out that day that I noticed that the fingers on it were broken. Not a big deal to me since I love the chippy and well loved look. But a big deal to the thrift store clerk. She insisted that it should not have made it to the sales floor since it was broken. She told me that they normally throw damaged things in the trash when they are sorting donations. The trash??? Not the trash!!! Does she not understand what those words do to a hoarder’s thrifter’s soul! When I got the statue home and looked it up on the internet, a few coincidences between my statue and the original statue struck me. Wikipedia (which we all know is the ultimate true source of all information) tells the story of the original Infant Jesus of Prague statue. To make a long story short, the original statue ended up being discarded in the trash and having its hand broken off. Trash? The thrift store clerk mentioned that mine should have been in the trash! Broken hand? Mine has a broken hand! Coincidences aside, I have thought recently about taking it (see I’m calling it “it”, so as to avoid the whole “him” capitalization dilemma) to the local nursing home and seeing if there is someone there that would cherish it for its religious value. It seems selfish of me to just admire it for its prettiness factor rather than letting someone else use it as intended. What’s you opinion? If you were not of the Catholic faith, would you keep the statue because it’s pretty? Or find a new Catholic home for it? My grandfather came to the United states from Czechoslovakia in 1920. I have a devotion to the Infant of Prague. I have a small collection that I keep in a cabinet in my home. Most are “chippy” How sad to think it may have been discarded. I would be honored to give him a home. Thank you for saving him. I think if you are drawn to him, then it is safe to say he should be in your company. But, never throw him away; it is a holy image. You have rescued him from a landfill! I am RC but not practicing. Still, I love religous iconography. Many of these old statues do hold quite a value. I think the statue is incredibly neat and just because you are not RC doesn’t mean you can’t appreciate him – don’t be shy to keep him! Hi! I’m with you, this statue shouldn’t be disrespectfully thrown in the trash. Though no longer Catholic, I do like the statues and keep them as a reminder of my faith. 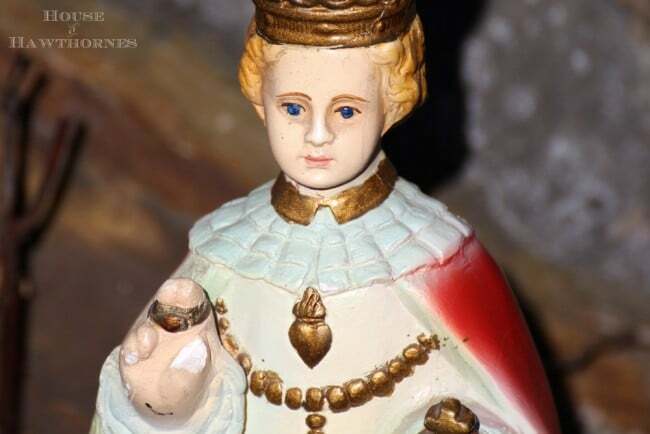 Usually when I find the Infant of Prague, He’s missing his two fingers and the cross on either his head or globe. And using paper clay, I’ll mold them back on. Course, that also means repainting Him. I spoke to a priest about these statues and he said that when they’re severely damaged, they will throw them away, but I think there’s a prayer said over them (or some kind of act) before doing this. I forget the details, but it has to do with these statues being blessed. As for me, anytime referring to God or Jesus, I always will cap He, Him, etc. That’s just me. I know a lot of people don’t. It saddens me knowing the thrift store throws these damaged statues away when someone like me enjoys restoring them. Please feel free to contact me with any other questions and I’ll do my best to answer. …and of course, I see a few times I didn’t cap “his” and spelled Protestant wrong! So much for trying to type with kids present! By the way, once a Jewish friend asked me, “Why do you have a Menorrah in your miniature shelf?” I had no idea it was a Menorrah, I just thought it was a pretty candelabra! I kept it. I don’t see any reason why you can’t keep this statue for pretties sake. I am not Catholic but I love my Holy Infant and rosaries. I am not RC but have many praying Mary’s and rosaries. I like religious symbols. I think Catholic religious symbols particularly interesting and pretty. If you are drawn to it keep it on your desk. I happened onto this site, but happily. 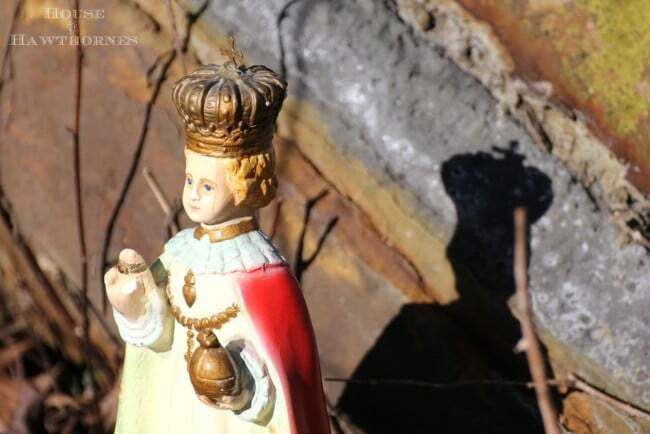 Now I know my poor chipped (fingers and crown) Infant Jesus of Prague statue might just stay on display as is. Dear previous commenters who were raised Catholic but no longer practice the faith: please come home….we need you!!! He needs you!!! Much love. home with you because YOU liked him. Keep the statue and enjoy him. i can totally see why you were drawn to him – he’s beautiful in his worn patina! do keep him!!! he was meant to be yours! and when the day comes that you are no longer able to care for him, then pass him on to a local home for someone else who may be in need of comfort. I’m glad you rescued Him. We recently inherited all of my MIL former religious statues since her death. Many of them need repair. My FIL wanted to throw them out. They been added to my list of things to restore. Enjoy Him Pam. I am Catholic, and I would definately keep this treasured statue. And the fact that the orignal statue has the broken fingers and your statue has broken fingers is a beautiful story to me. I love the red coat on Him, and I believe this sweet statue was meant to be with you. Maybe someday someone will need your prayers and you can comfort them with this beloved gift. Oooops, I meant broken hand (I said fingers). I say keep it, and thanks for sharing at my party. Thank you for buying this baby Jesus ..as a Catholic I am in awe how it ended up in thrift store!!.. You saved a very sweet baby! I was raised Catholic also and I feel like if I gives you comfort and joy you should keep it-I don’t believe Catholic vs other religions-it is all one God and you were drawn to this statue maybe for this very questioning. You don’t have to be a Catholic to be drawn to the beauty of a Catholic image of Jesus. Enjoy Him and perhaps pass Him on to a Catholic someday if you wish. He is sweet. I’d say keep him. If he popped out at you at the store it must mean you like it. so keep it. If you like him, you should keep him. I would! He’s wonderful. Pam, I’m not Catholic, but I am a Christian and I love vintage, so I am drawn to any religious icon, be it saints, Mary, Jesus, or rosaries. I try to learn what each piece is so I know what I have and doing that I learn much. I also hate to see these in thrift shops, wondering what their lives were before I found them. But I’d rather see them on a store shelf than in the trash. I once found a plaster bust of Jesus in a curbside trash pile. I couldn’t leave him there and he came home with me. Save them all ! Thank you for sharing your story, Pam. For those wondering how these can end up in thrift stores, I have one simple explanation. We can’t keep everything that belonged to our parents. When my father died, we had to clean out his house. There were quite a few religious statues and icons. Growing up Roman Catholic, but no longer practicing, we couldn’t bring ourselves to throw them away as that just seemed wrong. 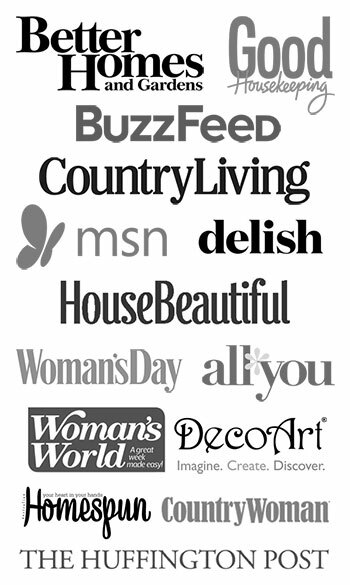 But with so many items to sort and make decisions about, these did not make the cut. So they were donated to a thrift store, in hopes that someone else might wish to have them. Your Holy Infant of Prague figure is lovely and has so much character. I have a small collection of Holy Infant of Prague figures. 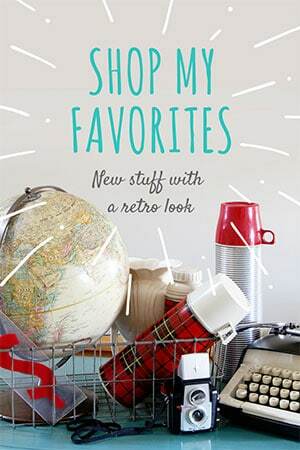 There was a period of time when I kept running across them at flea markets, thrift stores, garage sales, etc. Each one is different. I am not Catholic, but I do find each Holy Infant figure to be beautiful. It makes me feel calm and happy every time I look at them. I like to think of who might have had them before me, and who will appreciate them after me. 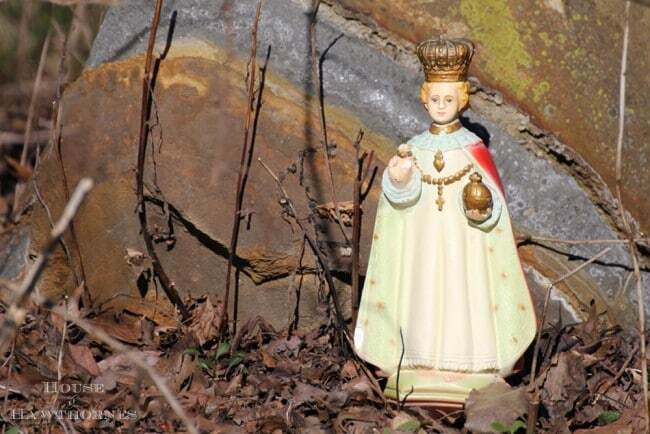 It may be that if the Holy Infant of Prague statue you found makes you happy, it was meant to have come home with you. I posted photos of my little collection of “found” Holy Infant of Prague figures back on December 24. You may find it interesting how they are each the same, but yet different from one another, and different from the one you have. I say keep and display this icon, Pam. I don’t think it’s irreverent for you to do so. I never saw any one in my family ever actually praying to religious statues. But then, maybe they just bought them because they were pretty! How’s it going, girlfriend? Are you third of our cold and damp winter weather yet? Can’t wait for spring to make its appearance! Pam I think you are such a sweet, sensitive person to be sharing this story in a post. I appreciate your desire to do the right thing and your worry about showing any insensitivity to others. This is the kind of goodness the Infant represents. Very beautiful. And I think non-Catholics can appreciate the Saints as well. Hello Pam, I think this little statue is adorable. I have quite a few around my house, and when I see one it reminds me to say a simple prayer of thanks. What better reason to keep it? After all you were drawn to it. I would pass it on to someone who can appreciate. I have a similar statue. Maybe one day you will visit Praha and buy a new one as a souvenir. Very nice post here thanks for it. I always like and such a super contents of these post.Excellent and very cool idea and great content of different kinds of the valuable information. The important thing is that you saved it 🙂 In addition to its religious significance this Catholic statue is a piece of artwork and has been saved for future generations.